The Nerf N-Strike Elite Stryfe is one of the most impressive blasters available today. The core of the blaster is the flywheel-based motor which, while similar to those in the N-Strike Barricade and similar models, is amped-up for Elite status. 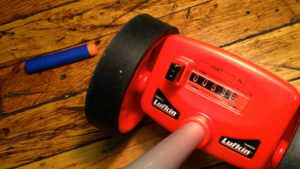 Powered by 4 “AA” batteries, and brandishing a design that doesn’t venture far from the typical Nerf look, this mid-range unit doesn’t scream “exceptional.” But with perhaps a single, notable flaw, it is truly one of the best all-around values in foam-dart blasters currently on the market. Having purchased the Stryfe on special at Amazon for $12.99 as a replacement to a trusty, battle-worn Barricade, we expected perhaps a modest improvement in performance versus the older Barricade, given the Stryfe’s “Elite” status. But what we didn’t expect was how much overall performance could be achieved by a blaster in this price range. In fact, right out of the box, the Stryfe was shooting with consistent mid-40 foot ranges (flat), with upper-50s possible with a slight arc (30 degrees). In addition, the grouping of the shots was remarkably good—something that we have NOT found to be the case with plunger-based Elite models. But what really blew us away was the incredible rate-of-fire. In our testing, we were able to consistently meet or exceed 2 shots per second, and with very little jamming. Now, we know what you’re thinking… yes, it’s a flywheel (“Acceleration Trigger”) model, so not only can your adversary hear you coming, when firing in rapid succession, the flywheel doesn’t have enough time to ramp-up and provide maximum distance over multiple shots. Thus, you are required to be closer to your target and, coincidentally, more easily discovered due to the whirring of the wheel. This long-standing Achilles heel of flywheel-based models is still true. However, the recovery time with this Elite model Stryfe proved significantly faster than with non-Elite models we’ve tried, like the Barricade and Rayven. So while we weren’t clearing 50 feet while attempting the maximum rate-of-tire, we can say that mid-30s was still completely achievable. And in a close-quarters battle where maximum range isn’t crucial, this impressive rate-of-fire more than makes up for the loss of range. So, the rate-of-fire was extremely impressive, and the range was solid (if, perhaps, somewhat less than the “75 feet” Hasbro claims for the line). But what was almost as impressive as the stream of rapid, long-range shots was the consistency of those shots. While our disc-based blasters tend to shoot curved, but consistent shots, our dart blasters like the Triad and Strongarm typically shoot Elite darts great distances, but with comically poor accuracy. And our shotgun-like models (Rough Cut and Barrel Break) are even worse… sure, you can shoot 2 darts at once, but they fly out of the barrels like model rockets without fins. So when the value-priced Stryfe started shooting 40+ foot ranges at 2 shots per second with dart groupings of a just a couple feet, we were truly impressed. And it did this over-and-over, all day long, with very little in the way of jamming or mechanical issues. This tagger is so fast, and so enjoyable to use, crippling it with a meager 6-shot standard clip is like some kind of cruel joke. All of which brings us to our single point of real contention with this blaster—it simply doesn’t hold enough rounds. With a meager, 6-shot dart cartridge, a user is potentially out of ammo within 3 seconds of use. Let me repeat that—if you are using this blaster in the middle of a competition, you will be out of ammunition within the first 3 seconds of your game. And that’s the irony. This tagger is so fast, and so enjoyable to use, crippling it with a meager 6-shot standard clip (and standard 6 dart pack-in) is like some kind of cruel joke. 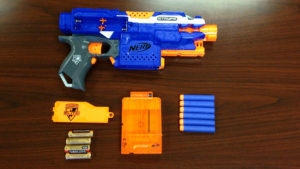 Obviously, there are ways around this, including the excellent, Kohl’s-exclusive “Stryfe CS-18 Mission Kit,” which includes an 18 round clip (at an average price of a whopping $59.99–look for it on-sale around the holidays for $29.99), but having to purchase any kind of accessory to make the blaster more enjoyable—more usable, even—smacks of penny-pinching (or worse, accessory gouging) at Hasbro. The Stryfe, then, is an outstanding blaster in its own right, hobbled only Hasbro’s decision to pair it with an entirely insufficient ammo clip for a tagger with these kinds of fire rates. If your gaming tends to be of the close-quarters variety, and you already own larger clips and additional Elite darts, we can’t recommend the Stryfe highly enough. 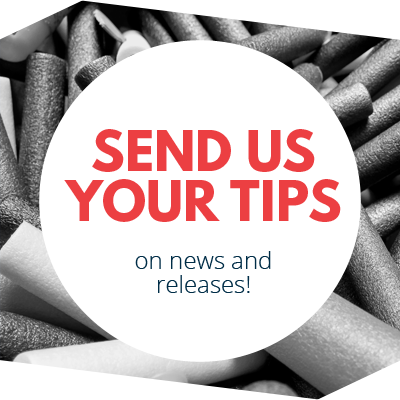 And even if you’re just getting into the scene and you want a great first weapon, we’d still recommend the Stryfe—just be sure your budget allows for a second clip. UPDATE: Since we originally posted this article, we have encountered numerous jamming issues with both of the Stryfe units we had on-hand. The primary issue seems to related to the ammo clip being held just slightly too low in the body (regardless of the clip or drum type), as a gentle push upward on the clip will alleviate 75% of the problems. Still, even with this “fix,” we would occasionally encounter a stuck trigger or jammed dart. 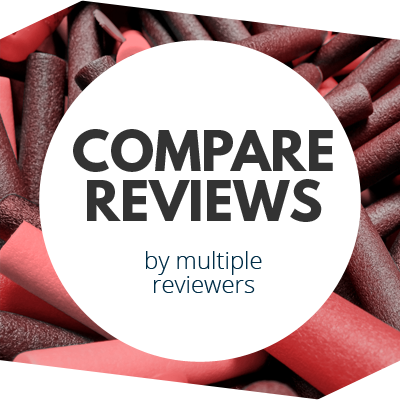 We still like this blaster, but these potential reliability problems have caused us to reduce this blaster’s overall score and “Top Shot” recommendation since our initial review. This entry was posted in Dart Blasters, Reviews and tagged nerf, review, stryfe on November 29, 2013 by blasterhub. Fantastic gun! I just picked this one up recently! The ammo clip it comes with is pretty small, but I have a barrel clip that holds about 20 rounds and feels just perfect for this size gun with it’s higher rate of fire. This blaster has required modding for it to work reliably. Otherwise, if the dart is in slightly the wrong place, it will not fire. If the dart is bad and it squishes up, it will jam. However, once the offending parts are removed, it works wonderfully. Once modded, this gun absolutely dominates close quarters battles. If you, like myself, previously owned the 35-dart drum from the Raider, you are handling a magnificent gun. Popping in ultrafires or configuring a 9v battery to run after taking out locks and current resistors and the field is yours. I’m in the process of ordering new motors just to kick things up another notch. Soldering iron is required though. Hey blaster labs, I noticed that the stryfe’s 2 darts PS tested rate of fire was included in its pros as “incredible” (rated 8), and the Retaliator Elite XD’s 1.7 darts PS tested rate of fire was included in its cons as “medicore”(rated 5). note that, in an 8/10 situation, it is only two points away from being maximum. 5/10 is halfway. MEDIocre. medi means middle, so 5/10 is mediocre. The reason for the stuck trigger (And probably most of the jam problems) is due to the fact that there is a dart “sensor” that MUST be removed. I say it is an essential mod. Stock, the blaster only fired 11 out of 12 darts in a 12 dart clip BECAUSE of the dart “sensor”. About the other jams, it could be due to the fact of lower batteries. I (previously) owned a stryfe, so I know first hand the problems you mention. sometimes, to slow of a trigger pull will result in a dart jamming.